Enjoy a self-guided walking tour in Kralendijk. Although many of Bonaire’s visitors come for the island’s well-known watersports, there is a history of the island as well, which is often overlooked. 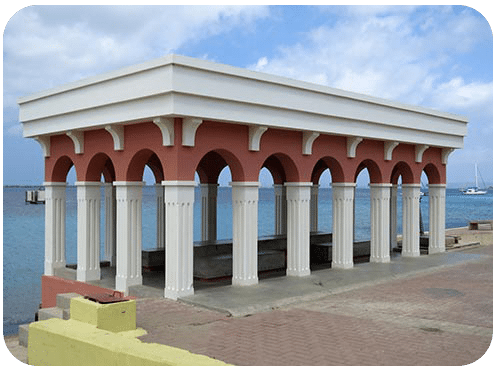 In recent years, the Bonaire Monument Foundation has held an annual event each September, Monument Day, during which some of Bonaire’s historic buildings have been designated as official monuments. 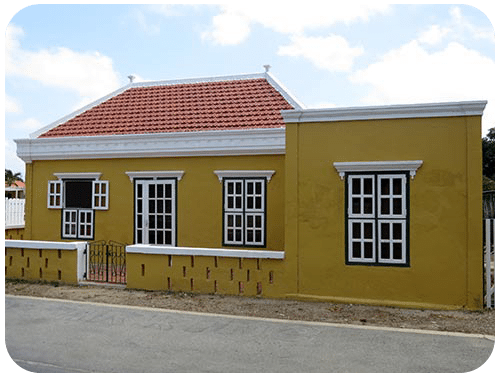 Many of these historic edifices have been restored and now house governmental or private business entities or still private homes, but their structures provide an interesting glimpse into life on Bonaire in earlier centuries. The majority of these monuments are in Kralendijk and can be easily viewed via a self-guided walking tour, lasting about two hours. 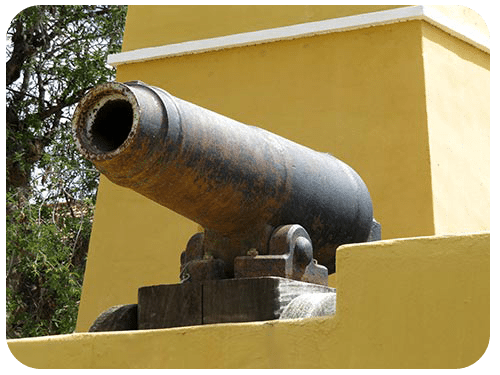 In 1796, the Chairman of the Military Committee of Curacao, Johan Rudolf Lauffer, ordered the building of a fortress on Bonaire to protect the people living on the island, as these were troubled times at the end of the 18th century. The fort was built at the end of a dike of coral stone. The commander of the island lived here until 1837 when his new home was built next door. The fort never saw action. During the second British occupation of 1807 to 1816, the original ancient cannons were replaced by those we still see today. In 1868 to 1869, a wooden lighthouse was added to Fort Oranje and in 1932, the current tower was built of stone. The fort building was restored in 1999 and is now the island’s courthouse. 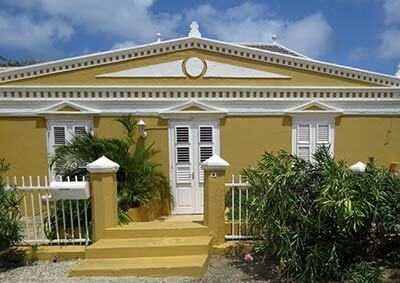 This protected monument was built in 1837 as a staff residence for the Commander/Governor of the island. The building was erected in stone on a rectangular plan on two floors and a roof. The two floors consist of a rectangular core with long side galleries. The core is covered with a gabled roof which connects the galleries’ pent roofs. The roofs are caught between the two profiled spout facades and covered in red tiles. At the front (west side), there is a large balcony with an arch structure and semi-circular pilasters. 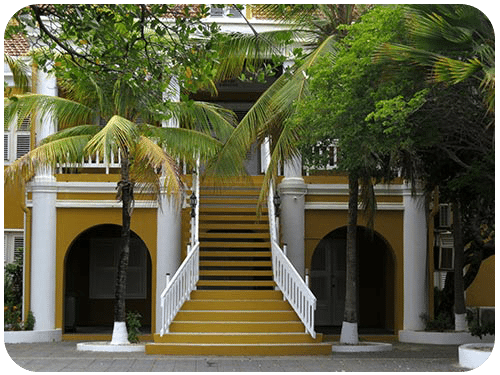 This historic building was restored in 1972 and became the island government’s main office building. This monumental building was the residence of Cornelis Raven Debrot (1854-1921) and his family. The building was later used for various governmental functions. This protected monument is an example of a house in the neoclassical style. The building is made of stone. Its architecture consists of three rectangular blocks whose long sides adjoin one another, with two transverse rectangular building blocks adjoining in the rear. All five blocks are covered with hipped roofs, which connect to each other. The roofs are covered with black glazed tiles. All hips and ridges are cemented, and at the ends are Pirons (ornaments). It was built in approximately 1890. 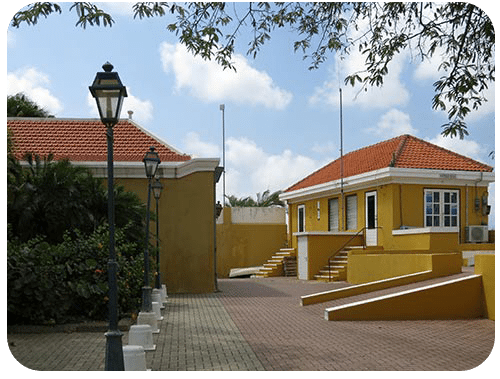 It was restored and reopened in 1980 as the Island Parliament House where the Island Council meets. 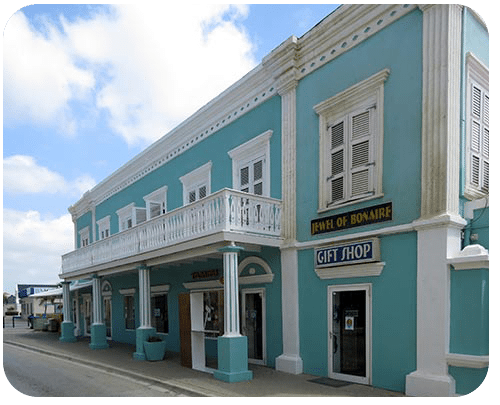 This plaza, commonly known as Bonaire’s open-air fruit and vegetable marketplace, was constructed of concrete in 1937 with a rectangular floor plan. The building has a flat roof, and elevations are formed by arch structures to square columns, which have classic fluted and chamfered corners. The long sides have six arches and the short sides each have three arches. Above the arches is a greatly projecting profiled frame, which rests on the columns. The lower side of the consoles is connected to the spandrels between the arches. This building, constructed in stone, has a rectangular core with two floors and a gallery for a floor. The core is covered with a gabled roof between two vertical walls, and the gallery with a pitched roof between vertical walls. The roof originally consisted of cross pans, but in the last restoration, these were replaced by plastic tile sheets with kruispanmotief. This building had been used for many years as a restaurant, but now houses a bank. 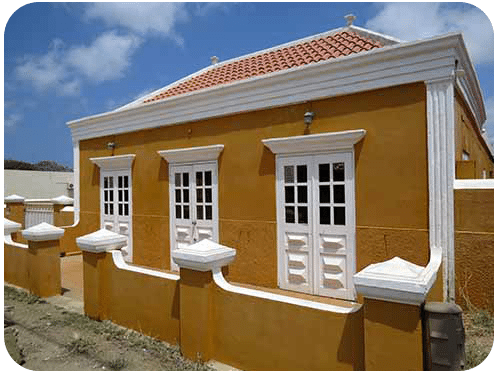 Since its original construction, this home has been in the hands of the Herrera Family, well known on Bonaire. It was constructed at the end of the nineteenth-century stone edifices and consists of five blocks, each covered with a hipped roof in tiles. As was the norm, hips, and ridges are covered with white brick bands and one once again finds Pirons at the ends of the lugs. This is a beautiful example of the neoclassical style with ornate ornamentation. The decorations of the façade refer to the Jewish ancestry of the Herrera Family. 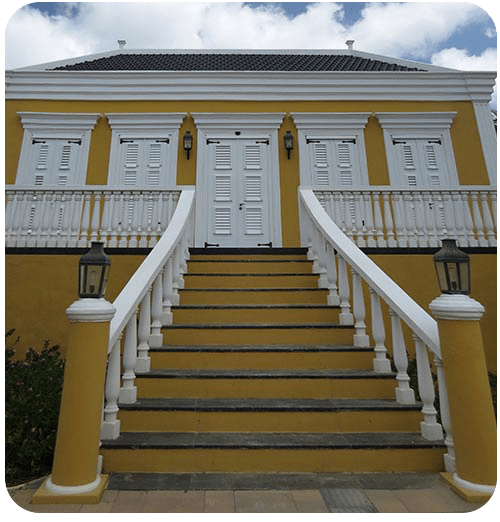 This building is one of the largest on Kaya Grandi in Kralendijk, built in the neoclassical style with beautiful ornamentation. It is constructed in stone, and it consists of five blocks on two floors. The upstairs was traditionally the main floor, while the lower floor was used for business purposes. All blocks are topped with tiled hipped roofs, with the normal white bridge bands on the ends. Pirons are also found in this building. This building exhibits another characteristic of the neoclassical style, with broad profiled gutter lists and white vertical strips on the corners of the building, as well as on the transitions between the blocks. For the time of its construction, the ornament ring of the gutter lists is remarkable. This building is a fine example of a former merchant’s home with an elegant flat on the upper floor, with shops or offices available on the ground floor. 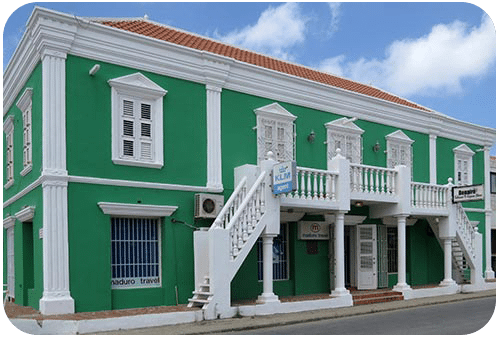 This building was also built in a neoclassical style and consists of two cascaded rectangular blocks, covered with tiled hipped roofs. As was normal at that time, the hips and ridges are covered in white brick bands on the ends, and the Pirons are characteristic for this style, with their broad profiled channel lists and white vertical strips at the corners of the building. Another fine example of classical elements are the triangles (pediments) above the windows and doors on the façade of the upper floor living area. 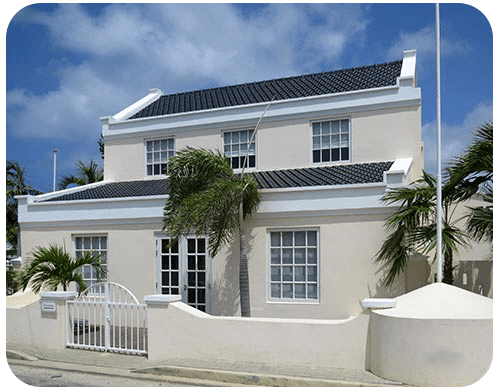 This home, sitting on the seafront promenade, is a fine example of a neoclassical structure. The original house was composed of a number of rectangular blocks, which are covered by hipped roofs. A characteristic of this neoclassical style is the ornate cast lists and the vertical strips at the corners (pilaster strips). The roofs are covered with red tiles and the hips and ridges are equipped with brick white bands. At the ends are Pirons, which are wooden vertical posts of the cap structure which protrudes above the roof. The façade has a door in the middle and a window opening on either side. Above the doors and windows are white water tables, which shed rainwater away from the door and windows. The doors and windows have shutters as well. 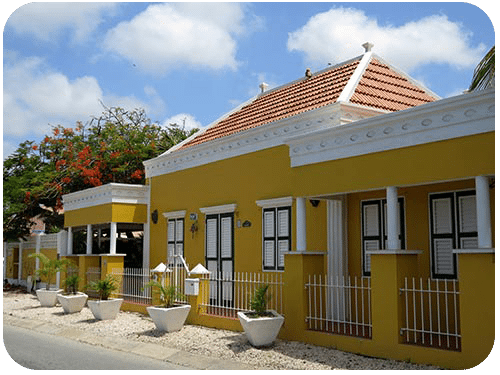 This is a characteristic part of the traditional architecture on Bonaire. This building is one of the smaller houses in the area of Kralendijk, but it has a monumental character. It was built in stone and has two blocks with a rectangular floor, both of which are covered with a hipped roof. As usual, the hips and ridges are covered with white brick bands on the ends and one also finds ornamental Pirons. This house was built around 1920. This building, constructed in stone, consists of six blocks. The two in front are transverse to the axis of the building, and the four in the back are lengthwise on the west and east side of the whole, interspersed with a patio. This building is also in the neoclassical style, with less refined details of some of the other neoclassical monuments. All of the blocks are covered with a hipped roof and tiled in red. Here one also sees that the hips and ridges are covered with white brick bands with Pirons at the ends.